“It’s a Jeep”, said Irving ‘Red’ Hausmann, Willys-Overland Motors’ chief test-driver, after giving a demonstration of the Willys Quad prototype’s off-road ability by driving it up and down the steps of the US Capitol at a press event. Katherine Hillyer, a Washington Daily News journalist, didn’t miss it, and her article (dated February 20 1941) carried a picture of the vehicle going up the Capitol steps, with the word ‘jeep’ in the long caption. THAT, ladies and gentlemen, remains the first documented record of the usage of ‘Jeep’ for a vehicle. Of course, there are legends around how and when the term was coined for the vehicle, including one involving Eugene The Jeep, a character from the Popeye comic strip, who had supernatural powers and, therefore, could go anywhere (just like the Jeep, then), but though all such stories might even be interconnected, I’ve taken the one that has the most proper validation. The Jeep trademark, however, was applied for in 1943 but it could only be obtained, after much hassle, in 1950! So, yes, Jeep was initially a vehicle; it became a company much later on. But not before it became a cult, and then a brand in itself. It had to be. Even General Dwight D. Eisenhower, Chief of the US Army during World War 2, did say that the Jeep was one of the top three tools responsible for the win of the Allied forces. A lot of these jeeps came to India as well before Independence, and well-restored examples now go for the price of a new Scorpio. In fact, more than six lakh military jeeps were produced during the war and a lot of them, after the war, ended in the surplus market, which, together with the popularity of the new Civilian Jeeps (CJs) as well, inspired the likes of Land Rover to build 4x4s. Now you know who made the go-anywhere vehicles first. Dig deeper and you’ll find that even the Hummer wouldn’t have happened if it wasn’t for the Jeep. 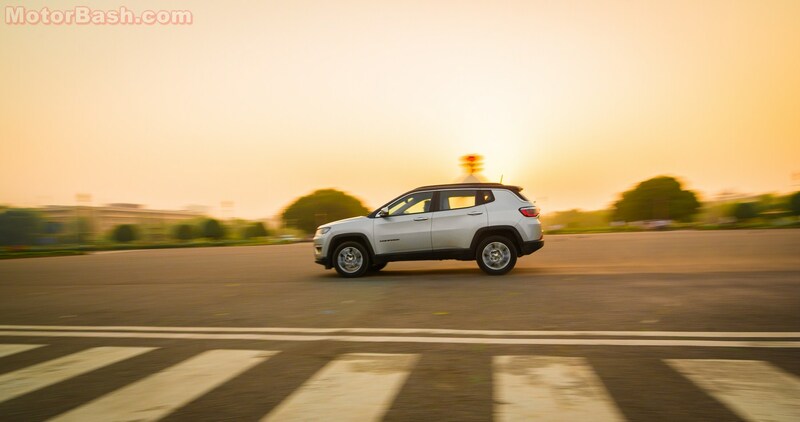 Crux is, the Jeep was the forebearer of what we now call the SUV. Which also reminds me to tell you that Mahindra & Mahindra learnt making 4x4s by first assembling CJs under license from Willys. See, this is the first Jeep review on our blog, so I had to delve a little into the history of the Jeep brand as, other than 4×4 enthusiasts, not many are aware that this is the same company that gave us the legendary jeeps such as the Willys MB, CJ-2A, CJ-3B, and CJ-5, among others. Heck, forget the masses, even a few auto journos are oblivious to it. One such enthusiastic bloke from a car blog in India did express a desire to drive my Jonga. It’s just that I don’t have a Jonga – what I have is a ’66 CJ-3B. Therefore, for one last time, a Jonga isn’t a Jeep, it’s a Nissan P60; a Gypsy isn’t a Jeep either, it’s an extended wheelbase version of the Suzuki SJ410/413; a Thar isn’t a Jeep too; it’s based on the M&M 440/540/550 series which were based on the CJ-5. These are capable off-roaders, but they aren’t Jeeps. I have even heard people referring to PCR (Police Control Room) vehicles such as Chevy Taveras, Toyota Innovas, etc., as Police Jeeps! Please don’t, unless you’re referring to the CJ-3Bs built by M&M under license from Willys, USA. Rest everything else that came after it is either a Jeep clone or an MUV, but not a Jeep. Also, Sumo is a wrestling sport. Okay, it’s also an MUV made by Tata. But it’s not a Jeep. So, from a company with that kind of 4×4 legacy and expertise, you would expect a vehicle that can drive over incorrectly-parked sedans and hatchbacks; crawl up to the terrace of your multistorey office building because, well, basement parking is for the commoners; and also allow you to help the damsels in distress in Mumbai rains? No, because, while the company does have a vehicle (the Wrangler Unlimited) that can do almost all of that, it has been priced way beyond the reach of those with such juvenile ambitions. However, in doing so, it slotted the brand as a premium/luxury/lifestyle (take your pick) name deep into the minds of the car buying populace in India, thereby creating an aspirational value that was, until then, only reserved for the posh Germans. And then they served the Compass on a platter, that too at a price range that make it look like it’s happy hours 24/7 at your favourite restaurant. But is it worth the hype? Of course it is! 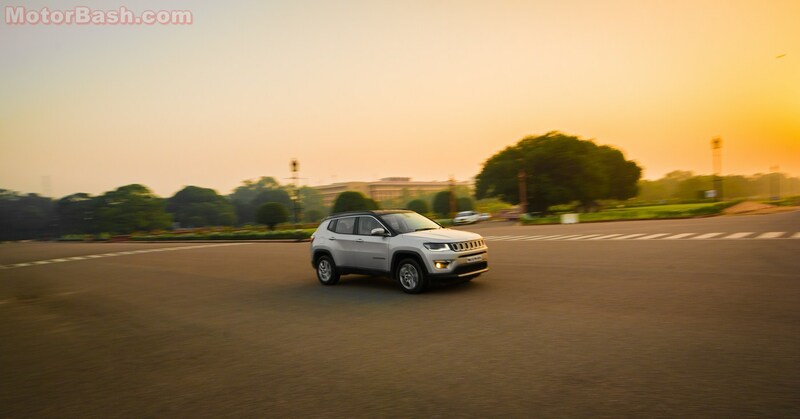 The Compass looks like a smaller Grand Cherokee, and that’s more than half the battle won, especially in the segment it plays. I say that because it’s all about style over substance in this segment. That’s why the Creta sells, right? It has the kind of style that the nouveau riche loves, and being a Hyundai it comes with more features than an LED TV remote. In fact, the only feature the Creta doesn’t have is a glovebox full of Sodexo coupons. And character. The Jeep has the latter though, in abundance. As usual, I am not going to bore you with poetic expressions around its shoulder line, traps, moustache, and such. I’m straight; you’re not blind, and Himanshu has done an amazing job with the photographs anyway. But I’ll certainly continue to tell you how I find it in the looks department. Bloody amazing! That’s what my optical nerve told my brain when I first saw the latest Jeep. I mean, just look at it! Does it not make you feel like it was carved out of one big solid block of adamantium, that too by Wolverine, with Thor’s hammer providing the finishing touch? I would like to think so. Most other SUVs, on the other hand, seem to be designed by a team comprising Drew Barrymore (or Preity Zinta, if Hollywood doesn’t float your boat), present-day Fardeen Khan, and Kim Kardashian (sorry, I couldn’t think of an Indian equivalent), and that too after a lot of quarrel and hair-pulling. I seriously don’t know why the SUVs nowadays have to have fluffy cheeks, double chins, and extra-large haunches that will never present a coherent picture. Thank God, and FCA, for the Jeep Compass, then. 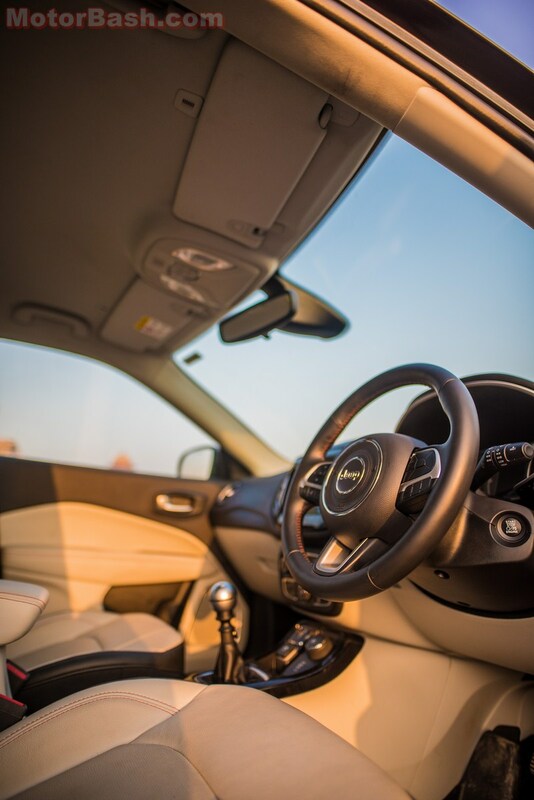 If you’ve ever owned a brand new car, or sat in one, you would have noticed that distinct ‘new car smell’, and it forms a part of experience of owning a new car, unless you have a perennial stuffy nose. However, even that new car smell varies in cars from different segments. This might now sound obvious to you at the moment, but, honestly, I could only conclude it recently after having tested more than a few cars in the past almost half a decade. So though I am a slow learner, I can now close my eyes and tell whether the car is a premium vehicle like, say, a Mercedes or a BMW, or an entry-level hatch like the RediGO, Kwid, Alto, etc. Of course, I won’t be able to zero in on the exact make and model, but I certainly won’t mistake an Eon for a Jaguar and vice-versa. 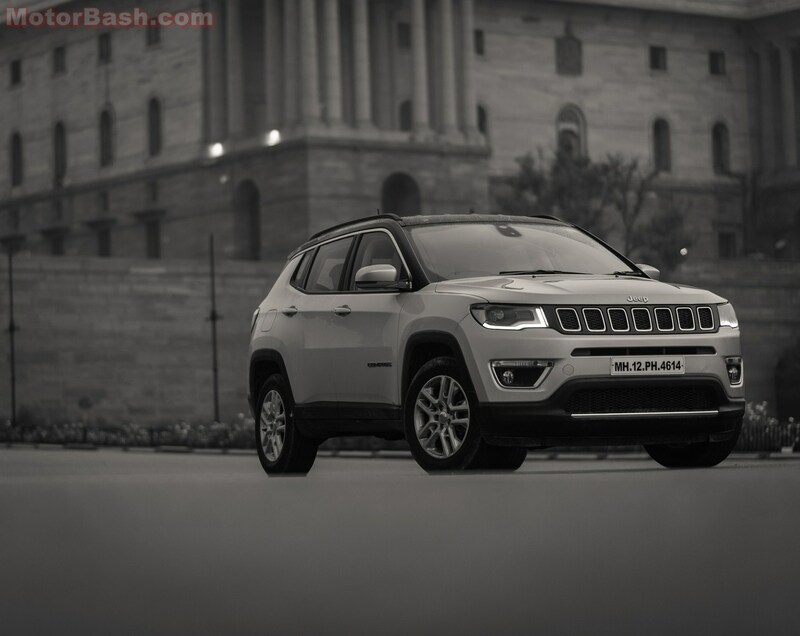 What about the Jeep Compass, then, you ask? I am happy to report, much to the chagrin of most, that it smells rich! And it should. 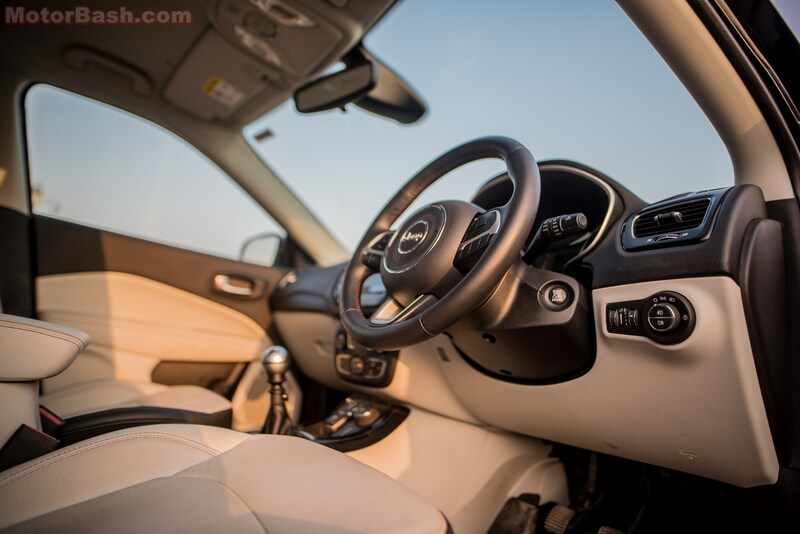 The interiors of a car are not only instrumental in heightening, or marring, the joy of owning a brand new car, they carry the power of swaying the whole buying decision altogether. Remember the first gen X1? The good chaps at FCA too could have botched it up here, but, thankfully, they didn’t. 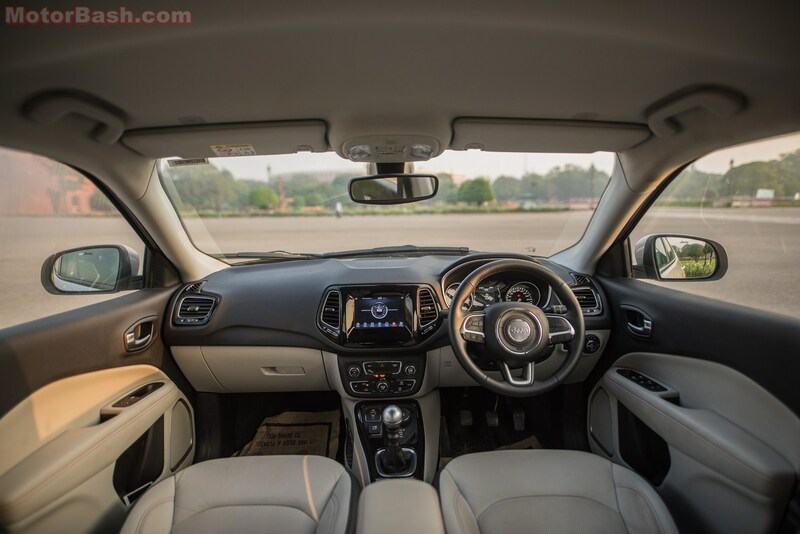 Open the door and you’re greeted with a cabin that looks, feels, and smells properly premium and posh, and would not look out of place in a 30-35 lakh-rupee car! I was testing the top-end Limited trim that gets this dual-tone scheme you see in the pictures; Sport (base variant) and Longitude (middle variant) get all-black dashboards. I like. But what I did not like is the omission of sunroof from the list of features! Come on FCA, even my neighbour’s WRV has one! Of course, only a panoramic would’ve cut it here, and it really wouldn’t have hurt Jeep to include it at least in the options list. Okay, Hyundai doesn’t offer it either, but Jeep is a premium brand and it should have had offered it, period. Anyway, that neighbor was still left mesmerized by the Jeep; a fact that I could tell by the look on his face, and something that got confirmed minutes later when he said, “this HAS to be my next SUV!” He will; he’s a young 26-year old businessman. Speaking of neighbours, who’re car lovers as well, a chauffeur, cleaning his Sahib’s E-Class, asked me if this Jeep was ‘more expensive than the Odyssey?’ The question had me stumped for a few seconds as I did not understand what car he was referring to. I knew that Honda does not sell its Odyssey here, and Land Rover also hasn’t come out with a special edition with that name, so what could it be? A little more verbal exchange with the chap allowed me to finally crack it. Heaving a sigh of relief, I’d exclaimed, “Aah! 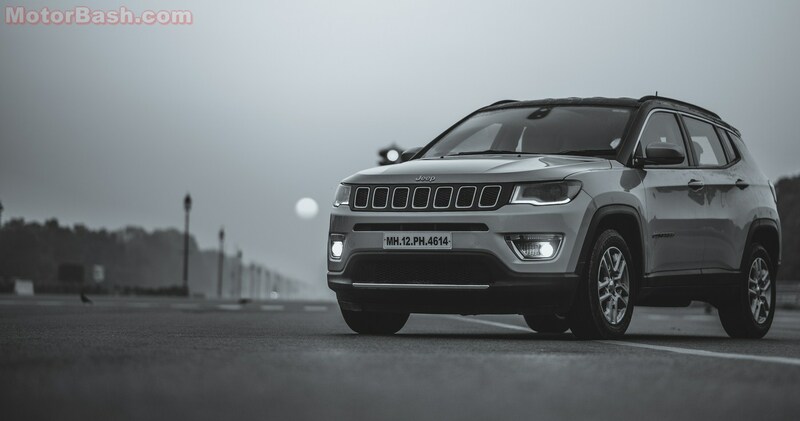 The Audi 6, you mean!” He nodded in the affirmative, with a smile, which was replaced by a look of astonishment when I told him that this, the top-end Jeep Compass 4×4, is more than 10-lakh rupees cheaper than the cheapest Audi, the A3! That’s a big win for the Compass! Okay, let me climb back in the Jeep’s cabin, close the door, and tell you more about it. But, as always, I won’t be telling you stuff that you can read in the brochure anyway; I’ll talk about things that you won’t ever find in a brochure or on a company’s website. So if you want to find out the types of seat upholstery on offer, please close this review and download the brochure. But, if you want to find out how comfortable the seats are, you’re on the right page. The front seats can be described in just one word – PERFECT. And that’s the first time I have used that adjective for the seats of an automobile, and if you’re new to our humble blog, you may verify the claim by checking all the car reviews posted by yours truly in the past few years. The seats are immensely comfortable without misforming into bean bags on long drives. 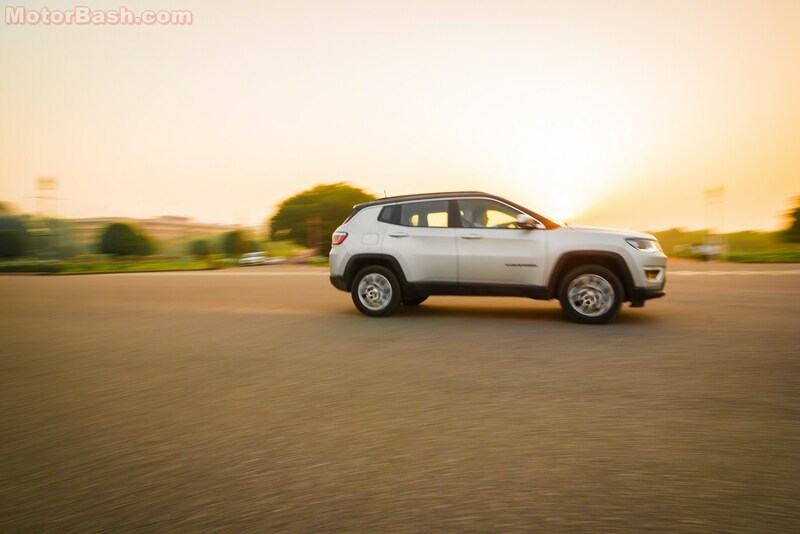 In fact, in addition to the fantastic bolstering all around, it is the firmness of the cushioning that Jeep has gotten just right, which compelled me to use the aforesaid adjective for the first time. The rear seats are almost equally nice, a fact corroborated by more than four people, that too from a diverse age group of 20-65-year olds, including a couple of six-footers. Which also means that leg room won’t ever be a worry, and, yes, three can sit comfortably abreast unless Lateral Shoulder Fly happens to be the favourite exercise of all three. The boot space, at 438 liters, is decent too if you compare it with Creta’s 402 litres, but would appear smaller when seen against the Tucson’s 513 litres. 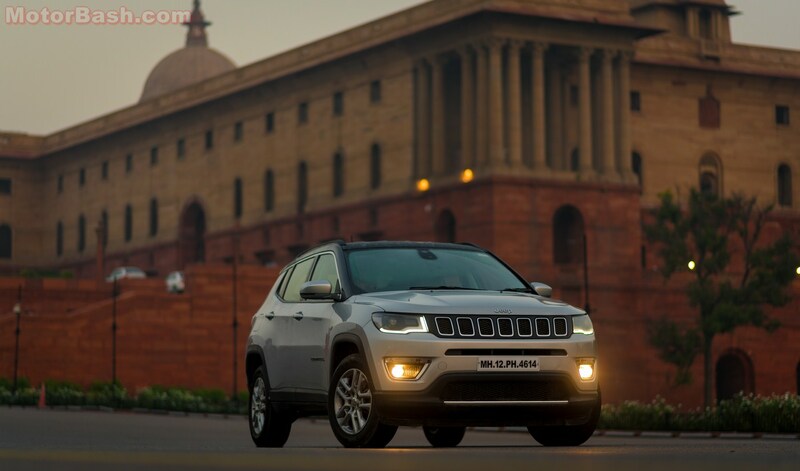 The Compass in India gets two engines for now; a 1.4-litre petrol, and a 2.0-litre diesel. 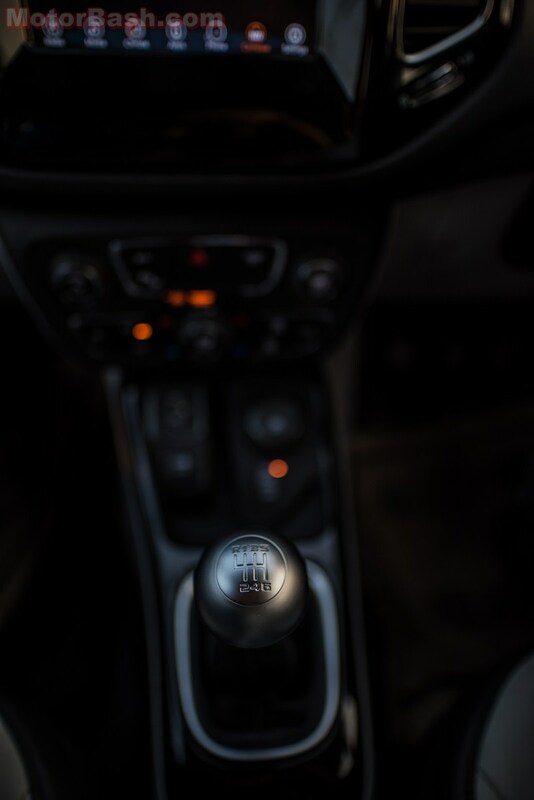 Both engines come with a six-speed manual gearbox, but it’s only the petrol that gets an automatic, that too a 7-speed DDCT (Dual Dry Clutch Transmission), but only in the top-end Limited avatar. 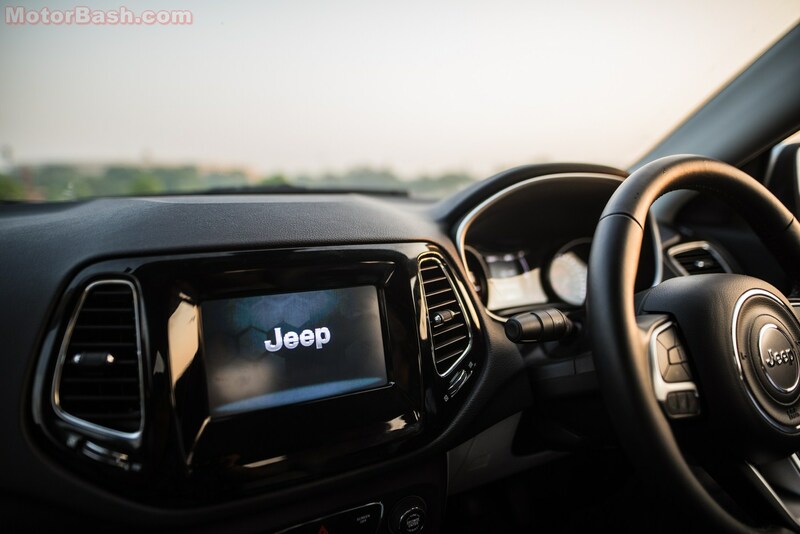 The diesel turned out to be the wiser though as it claimed Jeep’s Active Drive 4×4 system with Selec-Terrain, when the gifts were being distributed. Again, you get that only in the top-spec Limited variant. The petrol motor puts out 161 hp, which, to put things in perspective, is 13 hp more than what the Q3’s 1.4-litre petrol mill manages, though both SUVs’ torque output figure is identical – 250 Nm. Here, I must also tell you that the peak power and torque figures for the 2.0-litre petrol Tucson stand at 153 hp and 192 Nm, respectively. It’s interesting to note that the base petrol Tucson manual costs around three lakh rupees more than the base petrol Compass, while the petrol Tucson automatic is only offered in its mid-level GL trim, but is still more than a lakh rupees dearer than the top-end petrol Compass automatic! I didn’t get to drive that one though; I guess no one from the Indian auto media has. The diesel, producing 171 hp, and 350 Nm of torque, is what I drove. Again, for perspective, let me tell you that the XUV 500’s 2.2-litre engine puts out 140 hp, and 330 Nm of torque. It’s more than 200 kilos heavier than the Compass, which is not much really considering that the XUV is a seven-seater. 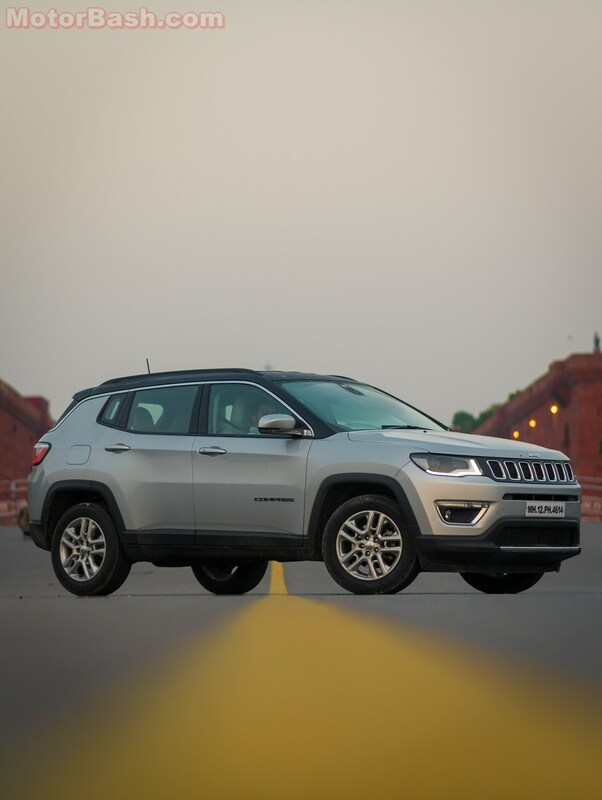 It’s clear that the Jeep has a better power-to-weight ratio, but the not-so-significant difference in weight also says a lot about the amount of adamantium, er, metal that must have gone into the making of the Compass. That, and a host of other active and passive features (go check the brochure again) got it a full five-star NCAP rating. It really does feel like you’re sitting in a tank; the doors shut with a solid thud, and please don’t even try to lift the bonnet casually; you’ll sprain a muscle or two. But don’t for a moment think that it moves like a heavy coach; I have already told you that it has a better power-to-weight ratio than the XUV, which itself is quite a sprightly vehicle. I couldn’t do a timed 0-100 km/h run, but the seat-of-the-pants feel tells me that the Compass would do it in less than ten seconds, which is quick! Slot the beautiful gear lever in first, bury the throttle, and release the clutch. The front wheels spin for a moment before the Active Drive 4×4 system frowns and sends the cavalry down south, pushing the Compass out of enemy lines in a jiffy. It may not be WW2 right now, but the sight of a huffing and puffing red DTC (Delhi Transport Corporation) bus in your rearview mirror seems even more threatening at that moment. But you’re in a Jeep, you remind yourself and hold your ground, with the Jeep silently (the NVH levels are exemplary) gesturing you that it has your back, and, with the lights going green you are out of the unpleasant spot before that bus ‘pilot’ is even able to honk. 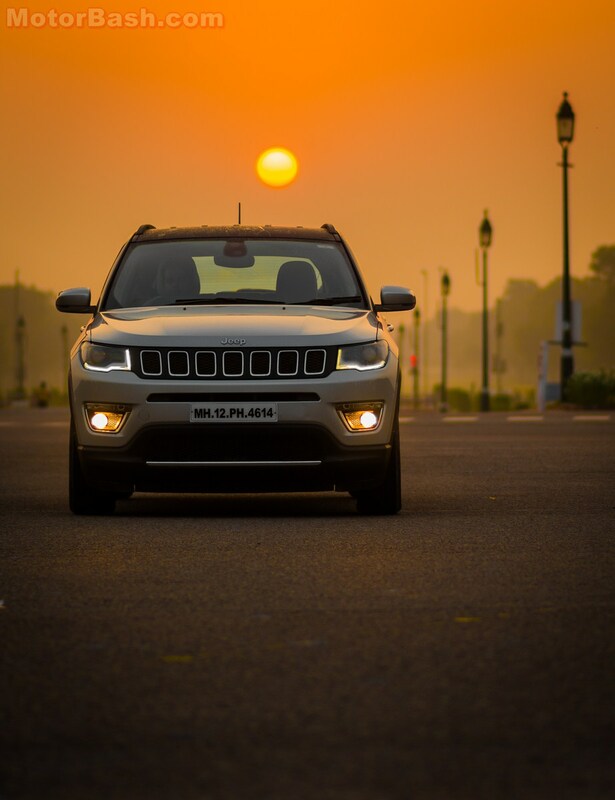 In fact, the Jeep has more than enough torque to bail you out of sticky situations, both figuratively and literally. Figuratively, because the humongous 350 Nm of torque ensures that you don’t have to frequently downshift to evade and overtake stupid people. Literally, because the Active Drive system will take you out of sticky mud and slush, as it comes with Selec-Terrain that has Sand, Snow, and Mud modes (in addition to the default Auto mode, where it remains an FWD mostly). 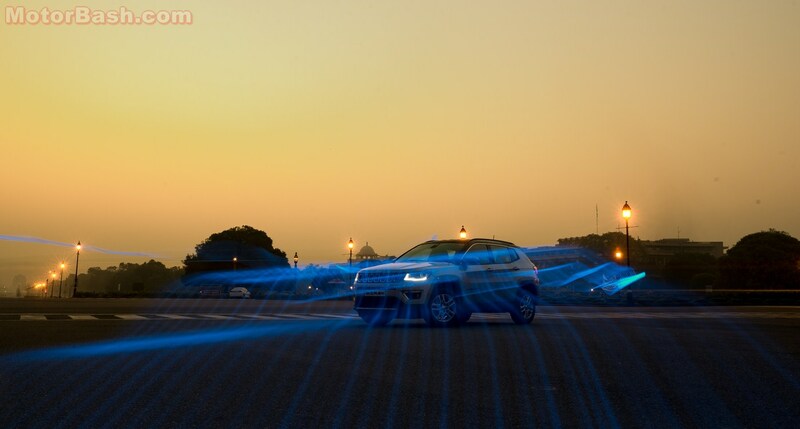 Theoretically, the different terrain modes not only optimize the working of the vehicle’s 4×4 system, but also adjust the throttle, braking, and ABS responses according to the type of terrain. Honestly, I couldn’t test it due to the limited amount of time I got with the Jeep, but it’s okay really as you won’t be attempting the RFC in posh SUVs anyway. A family 4×4 in India will mostly be used for a weekend getaway to the Jim Corbett and back, which would be a pity as the Compass is much, much, more capable than that, I reckon. 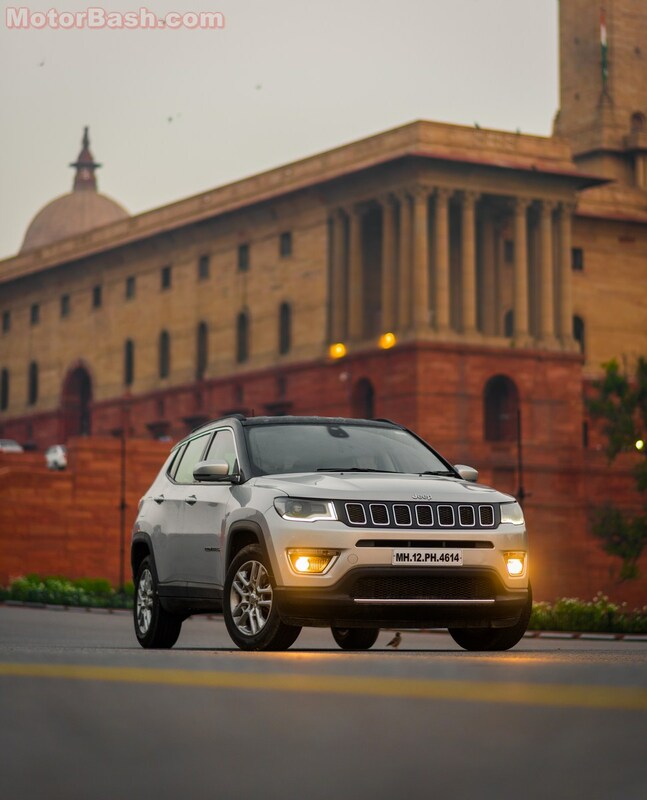 Let me know if you need a separate off-road test of the vehicle, and I’ll see if FCA India can oblige. As of now, the only irritant happens to be the lower lip of the front air-dam which did scrape the ground once, AFTER crossing a not-so-huge, but unmarked, speed-breaker. What I mean is, it cleared the hump, but since the vehicle speed was a shade higher than the optimum momentum required to tackle that bump, it was considered a ‘high frequency input’ by the FSD (Frequency Selective Damping) suspension. In such situations, the conscience of FSD thinks it prudent to save the occupants from the jolt, by compressing itself that much more, a piece of plastic kissing the ground gently being the only minor trade-off. It’s okay If you didn’t understand the science, both regular and moral; just know that this Jeep’s ride quality on really bad roads will always be brilliant, and also that the vehicle is high enough to not generally let anything else touch the ground. Even that plastic piece is flexible, and won’t break, I guess, until some over-enthusiastic auto journo, or his photographer, does something moronic that ‘would make for a nice picture’. That also reminds me to tell you that the Jeep’s official website does not mention the ground clearance (and also the boot space). I had to search online and noticed that it’s mentioned as 178 mm (unladen) for the Indian Compass by a portal that was among the many privileged ones to be invited for the media drive before the launch. Yet, only one reviewer talked about that figure. There might be a few more but since they belong to the breed of reviewers who believe that “the BMW Z4 has a V6 engine” and “the Abarth 595 comes with Record Monza exhausts in India”, I preferred to not go to them for figures and specifications not mentioned on the company’s official website. 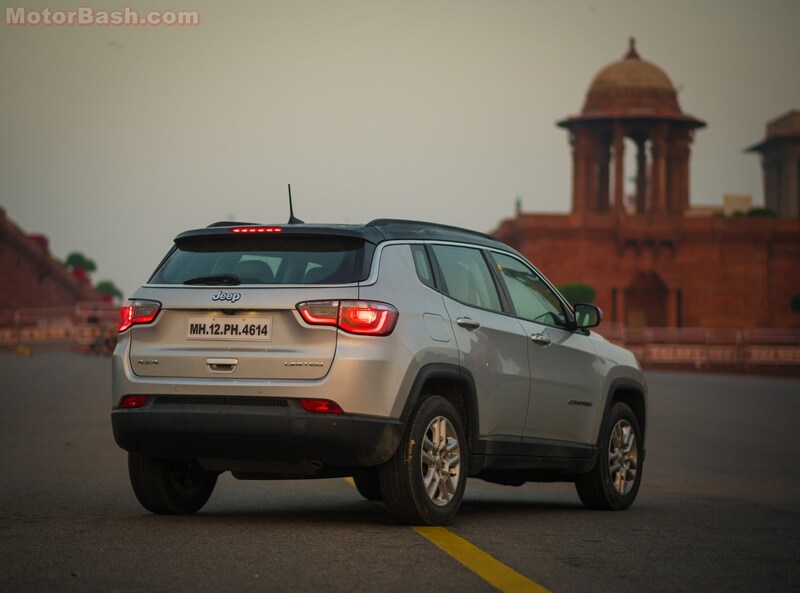 Anyway, forget the figures, I am willing to stick my neck out and say that, purely in terms of off-road ability, the Compass will come in top two if there ever is a competition of stock, four-door, 4x4s in the range of 20-50 lakh rupees. That said, like most other SUVs, it will also spend most of its time on tarmac, and this is where the Compass just spits on every SUV’s steering column, and I do mean every other SUV except the BMWs and Porsches. Here, I must tell you that Renault Duster and Captur are exceptional handlers too, but the Compass is just something else. First of all, it’s the size of its steering wheel that’s just perfect – neither too small nor too big. Of course, you don’t really get to see big steering wheels anymore, unless you drive and/or review stuff from MAN. But this is again the first time I felt that THIS is the perfect size for a steering wheel. And then there’s the beautifully-connected feel that it provides! That, together with a sublime chassis, inspires so much confidence that you start taking corners like you would do in a hot hatch, and I am not exaggerating a bit! 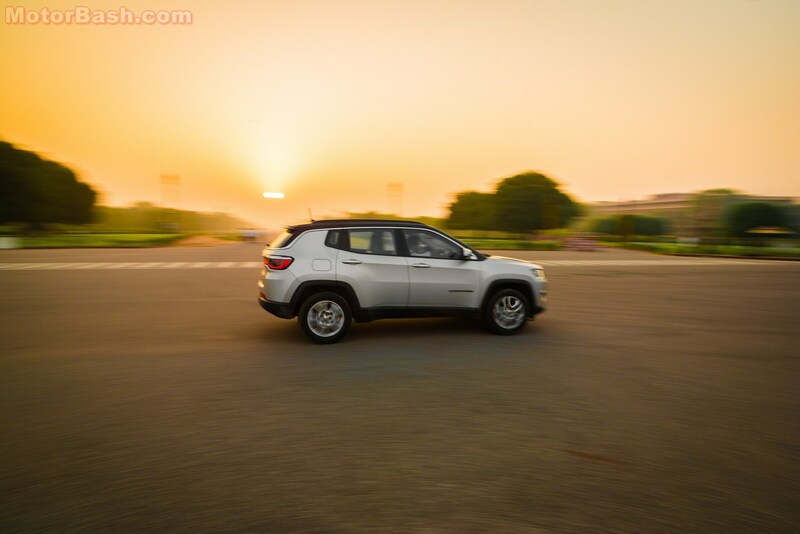 The BMW X1 has been my favourite in that segment for its handling and dynamics, and this Jeep comes darn close to it! Like in the X1, there is hardly any bodyroll and the thing is incredibly stable at triple-digit speeds too! I wasn’t expecting the Compass to be this good! That’s why you see so many exclamation marks in this section. The brakes are phenomenal too – they provide more feedback than a dominating girlfriend, and bite more ferociously than a scornful ex. The ABS is like a good neighbour who maintains distance, and interferes only when you need support to curb the enthusiasm of the aforementioned ladies. Now, other than not testing it off-road, there’s one more thing that I couldn’t test due to the paucity of time – fuel efficiency. I just couldn’t do the tankful-to-tankful test. But, all’s not lost as, despite a pessimistic on-board Average Fuel Consumption indicator continually showing 9 km/l, I can still give you a better idea about what the Jeep Compass managed under my hand. Taking range (distance to empty), fuel gauge level, and number of kilometers covered in this test into consideration, the figure that I get is 12.8 km/l. This was entirely in the city. Jeep’s website shows the ARAI figure as 16.3 km/l (17.1 km/l for the 4×2). I think, if I was able to get almost 13 km/l in city, that too by not driving too sanely, the Compass should be able to match the ARAI number easily. I would feel like laughing if, despite reading three-and-a-half thousand words, you still need a verdict. Okay, I’ll give you one, but it will be short. See, the Compass starts at INR 15.16 lakh and goes up to INR 21.37 lakh (all prices, ex-showroom, Delhi) for the top-end 4×4 variant we reviewed, straddling many segments including Creta at one end and Tucson at the other, while engulfing the XUV and Hexa as well. And then, in case you didn’t notice, it handles way better than all of them; rides better than them; goes quicker and faster than almost all of them; has the best 4×4 credentials in the world, and is the only one carrying a badge premium enough to stand in the first row with the three Germans. Also, unlike the XUV or the Hexa, the Compass is just the right size to be your only four-wheeler. It will take you everywhere – to office, malls, five-stars, gyms, Ladakh, everywhere – but won’t ever look out of place, despite always standing out. That actually brings a popular saying to my mind now; something that us off-roaders tell the car guys upon being asked why we love playing in the dirt and not, say, at one of those ice clubs at a mall. It goes like, “It’s a Jeep thing, you won’t understand!” Well, now you bloody well do. More Car Reviews. 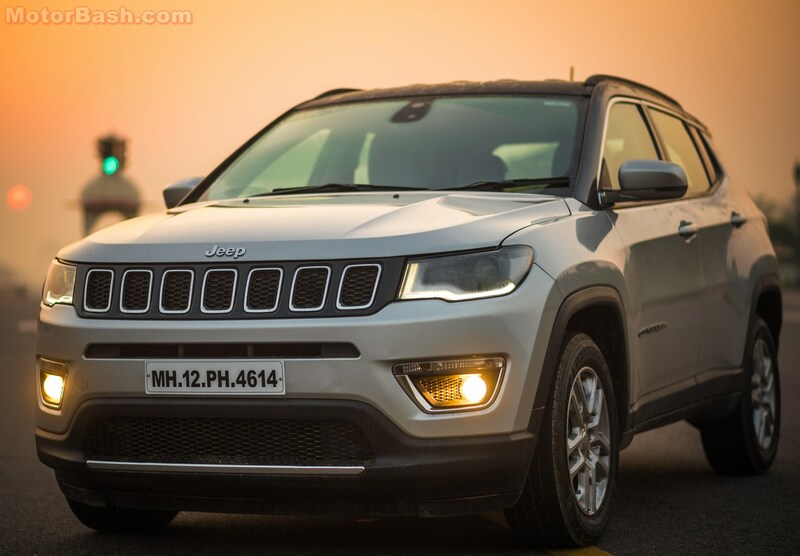 The Jeep Compass decimates everything in its segment, and then some! 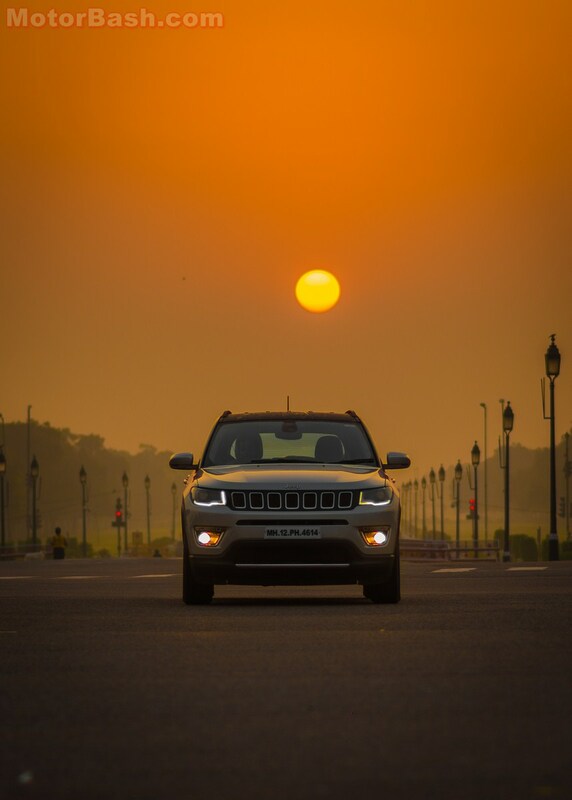 Syed what I have said is exactly what the Compass is really like been using the 4X4 limited version for the last 10 months n I love the car but the down side of these American companies is that they don’t deliver on service n now I have started to feel that Jeep might as well go down like Fiat coz of service. This is my personal experience n I have tried the helpline sending numerous mails to FCA regarding the same but looks like the FCA doesn’t control the dealers but it’s the other way round. Really feel very sorry for such a wonderful vehicle to go down like Fiat. Thanks a ton, Atul! An owner corroborating the observations, analyses, and conclusion (which is arrived at after testing the vehicles for a very short period) is the biggest compliment a reviewer can get! Thanks again!